Apple is in the process of building first-party map data with enhanced details versus the mix of third-party sources it previously depended on. Foot teams are presumably needed for the sake of pedestrian and cycling directions -- Apple Maps typically assumes people have to travel the same roadways as cars. That’s a great show of commitment. At first I wondered why not compile user-generated volunteered info for say bike routes. But then I realized I ride the wrong way on many one way streets, cut through off road, use alleys,etc. So now I see why Apple patiently trying to build a clean and lawful database. But anyway to do it faster? Please, yes, faster. Four states scheduled for this year seems amazingly low. It doesn’t take much to figure out it will take over 10 years to finish at this pace. And by that time who knows where the tech will be. I've seen the Apple Car a few times, alone with Google's Car driving around here. 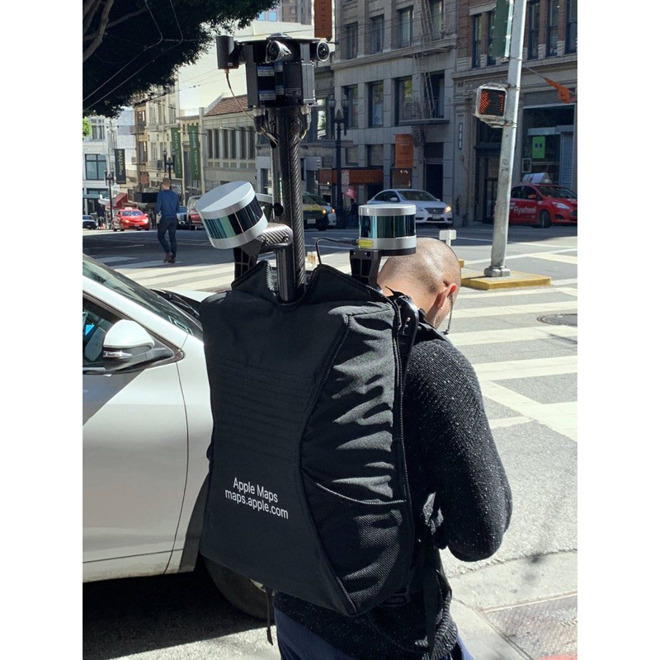 I'm just wondering when Apple will have their own Street View? They have been gathering that data. Even in this Backpack version, you can see all the camera's. Not sure I'd want to be walking around for long with that backpack on. Especially walking on Dirt trails and whatnot. Believing it will be linear is a mistake. With new initiatives, you learn first by doing. Then you replicate and scale. After they learn by doing, they will apply that knowledge to the project plans for the other states and rollout will commence, likely with many states in parallel. Sounds like a job for AI.